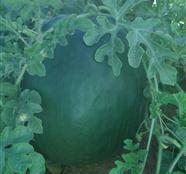 Round Sugar Baby hybrid watermelon. Very vigorous and productive vine, capable of setting multiple fruits per plant. The round, 9 - 12 Kg fruits, have a dark green strong rind with an intense deep red flesh. Blacky F1 is an excellent producer achieving tremendous yields.